On Saturday 11 November, Fetchers Walk will be closed for demolition. But there is to be a new walkway through the Paradise development. Looking at the construction site today, it is not easy to see how a safe walkway can be constructed in 7 days including this weekend. 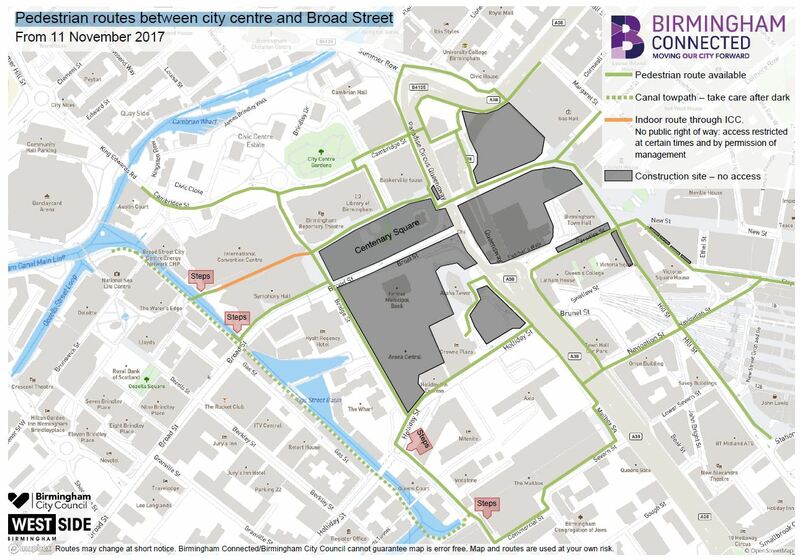 No matter, the official map released by Birmingham Connected showing suggested pedestrian walkways between the City Centre and Broad Street has been published and is shown below. This entry was posted in All the News, City Buildings. Bookmark the permalink. Checking yesterday (Tuesday), I had a similar feeling to you, Geoff. However my contacts in the Museum (who have very pressing reasons to have the direct route open ASAP, if not sooner) tell me that the builders are adamant that it will be ready in time. They are working through the nights and are under severe penalties if they fail!